Authentic Benchmark® band is made of Argentium Silver. Comfort fit. High polish finish with rounded edges. Width: 10mm. Benchmark's Argo collection offers a variety of designs in argentium silver. Argentium is the most advanced silver alloy in the market. 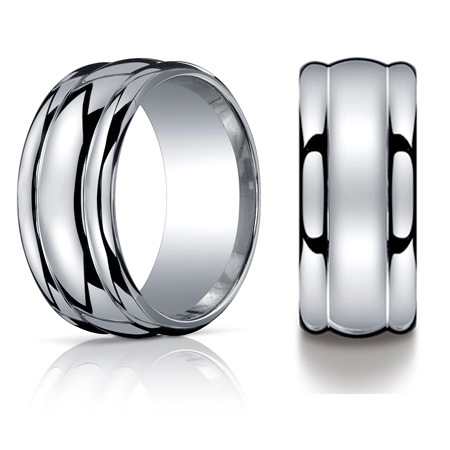 Benchmark's Argo rings are tarnish-resistant and stronger than sterling silver offered elsewhere. If your ring is ever damaged during normal wear, Benchmark will repair or replace your wedding ring free of charge. If your finger size ever changes, Benchmark will resize or replace your ring free of charge. In the case that Benchmark has to add material to your ring, you will only be charged for the difference in the additional metal or stones needed to restore the piece. Benchmark reserves the right to deny the Lifetime Guarantee for any ring that shows signs of abuse or tampering.